The best of this entertaining thriller is the depiction of the restaurant in Pigalle with its clientèle:the hookers,a couple of gays,"artists" ;the subject of racketeering ,on the other hand ,is hackneyed,being anyway one of the main themes of these black and white Films Noirs of the late fifties/early sixties.The most interesting element is the strong friendship between a cop (Blier) and the restaurant's owner (Philippe Nicaud ,who,unlike his co-star ,is almost completely forgotten today).They were brothers in arms in WW2 and the restaurateur saved the detective's life then. This male camaraderie is to suffer great hardships when Nicaud is involved in a murder (in self-defence);the trial is a great moment of fun: the judge tells one of the witnesses (a whore) that her language is refined :"I was a former teacher! "she replies .But even if the defendant is acquitted ,will he escape unscathed for all that? 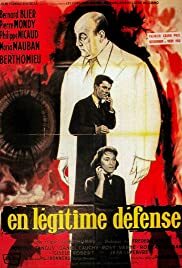 Pierre Mondy is excellent as the villain;and as the former user has already pointed it out,the final scene in a garage is solid film noir.